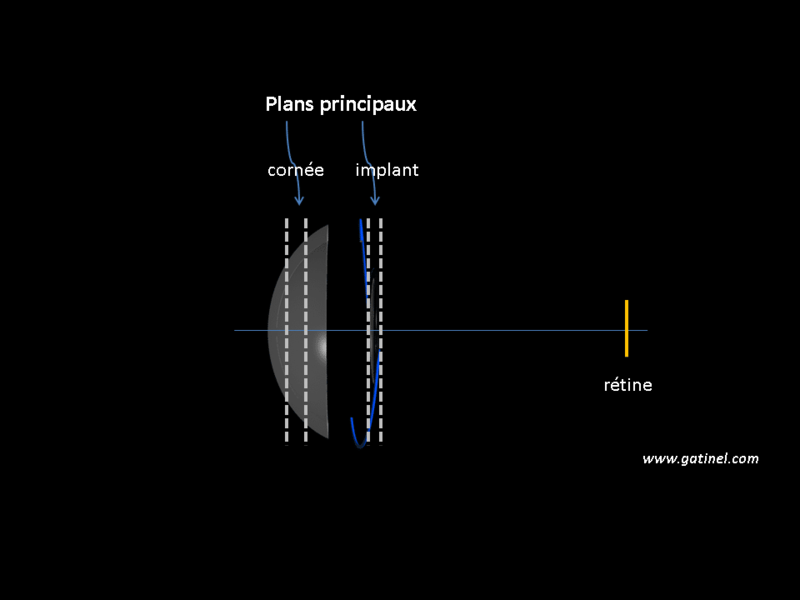 The calculation of the optical power of the implant to replace the lens is significant in cataract surgery time. In the case of the cataract surgery, removed the lens because it presents a responsible for clouding of Visual discomfort (loss of Visual acuity - tenths, glare, sailing, etc.). In the case of the clear lens surgery, removed the lens not clouded in a refractive aiming procedure: it is replaced by an implant whose optical power (vergence) is calculated to correct a severe refractive error (pronounced ametropia: high myopia, hyperopia strong,) astigmatism high). The optical power of the implant (vergence) is expressed in diopters (symbol: D): it allows to implant the optics to converge the light to the retina. It is calculated for an implant placed in a watery environment (mood watery at the front of the implant, and glass at the rear), which has a refractive index close of 1.33 (we usually choose the value n = 1, 336 for the environment in which bathes the implant). This page outlines the General principles of the calculation of the power of the implant in the cataract surgery. The calculation of the artificial lens and the cornea vergences used to establish a Basic theoretical formulawhich is still used today in the formulas of last generation. 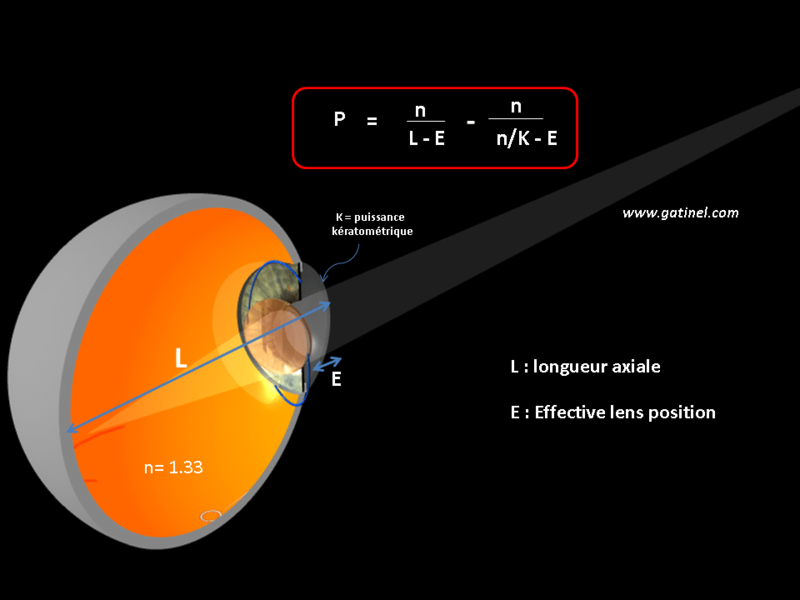 The elements involved in this calculation are, logically, the power of the cornea, the length of the eye (axial length), and the actual position of the implant in the eye. If the first two parameters are measurable before surgery, the third can only be predicted. It's in the way that the formulas "predict" the final position of the implant in the eye that are their main differences. 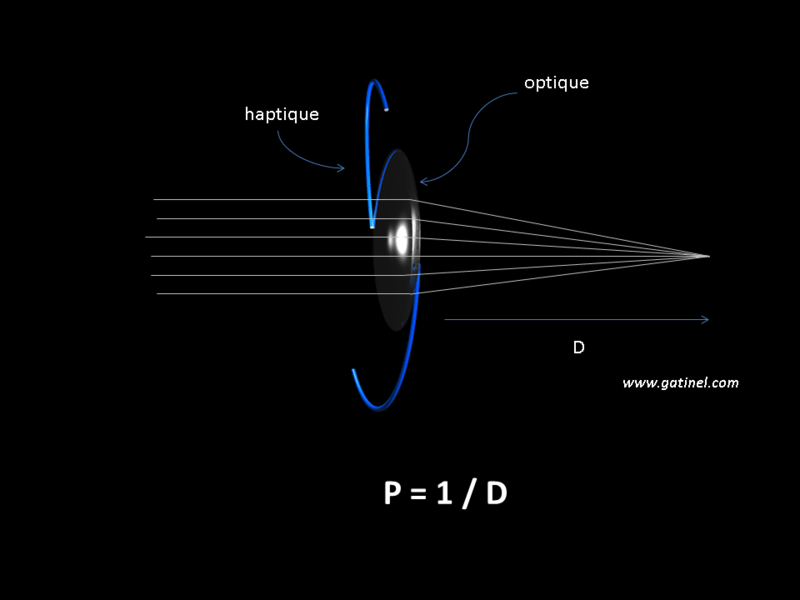 The power of the implant is the inverse of the distance where he focuses the light (focal distance in meters). The implant is considered to be "immersed" in an aqueous environment (in the air, his power would be higher). We consider here the implant as a 'thin' lens (neglecting its thickness - usually less than 1 mm - compared to the dimensions of the eye). Regardless of the indication of the withdrawal of the crystalline, le adequate choice of the power of the implant intended to replace determines the refractive resulti.e. 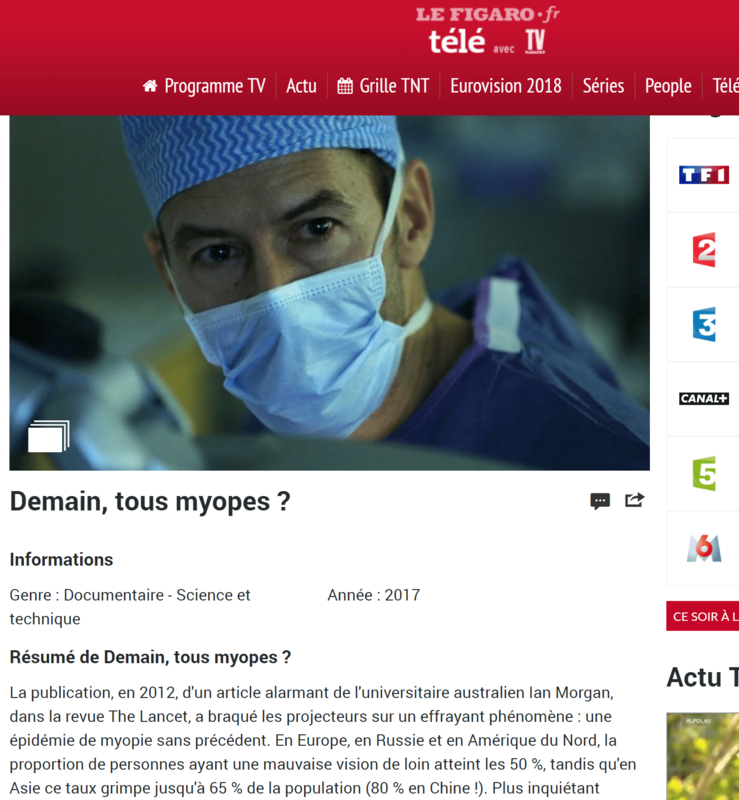 the ability to correct the optical deficiencies that existed before surgery (myopia, hypermetropia etc.) or maintain the absence of optical defect (emmetropia). To get the desired result of refractive, perform a preoperative calculation called biometrics. It is based on the consideration of certain eye measures, and their use in a formula. There are two types of forms: the statistical formulas, and the "exact" formulations, which appeal to an optical calculation. This page is dedicated to the establishment of a simple exact formula, based on optical computing and using the formula of vergence, including the calculation of the power of the implant is a direct and important application. 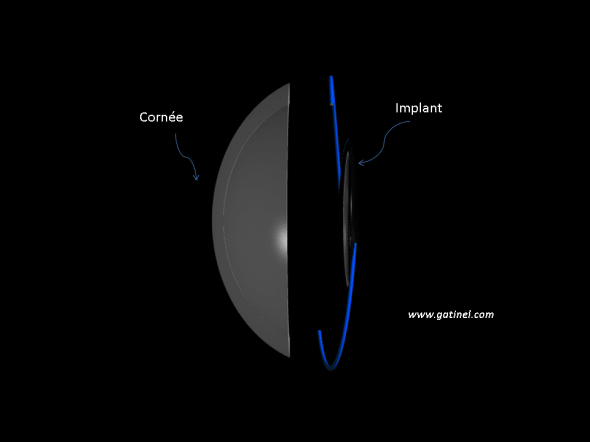 The operated eye of cataract with implant can be modelled as a simple, fitted with two lenses optical system: the cornea, and the implant. The couple "cornea and implant" must have a refractive power able to focus the incident light emitted from a distant source towards the retina. The thickness of the lens and the implant is neglected: they are considered thin lenses. The purpose of our calculation is to establish a formula that provides the power of the implant to the eye to be Emmetropic, i.e. with a clear vision from afar without having need to equip it in glasses or contact lenses. To get a clear vision from afar, the optical power of the cornea and the artificial lens implant allow the incident light rays emitted by a distant source to be focused on the retina. The cataract surgery does not significantly change the optical power of the cornea; the vergence of the cornea can be measured in preoperative. The axial length of the eye, which is the distance included between the cornea and the retina is also unchanged after surgery. The removal of the lens 'reduced' the vergence of the eye: light is focused behind the retina by single cornea; the eye became farsighted. The addition of the implant should increase the vergence of the eye in order to "bring back" the focal plane of the couple horny + implant in the plan of the retina. -the position of the implant to the cornea, called the effective position of the implant (effective lens position): there is a uncertainty to the position of the implant, and this point is important. VI = Vo + D or Vi is the vergence of the image, the vergence of the object Vo and D the lens power: these sizes are expressed in the unit "diopter. Vo is equal to the inverse of the distance of the object (noted D0) of the lens (in meter, with a negative sign by convention if this distance is directed to the left) and Vi is equal to the inverse of the distance of the image (noted Di, expressed in meters with a positive sign if this distance is pointing to the right). Application of the horny vergence to the torque formula + implant. A source object, the image formed is dependent on two successive refractions: that of the cornea, then that of the implant. The optical power of the cornea is K, and is measured before the surgery (keratometry). For an object at infinity, the vergence Vo is zero (D0 is infinite). The Vi vergence is equal to n/Di, where n is the refractive index of the glass. The following figure provides information on the position of the image to the implant. 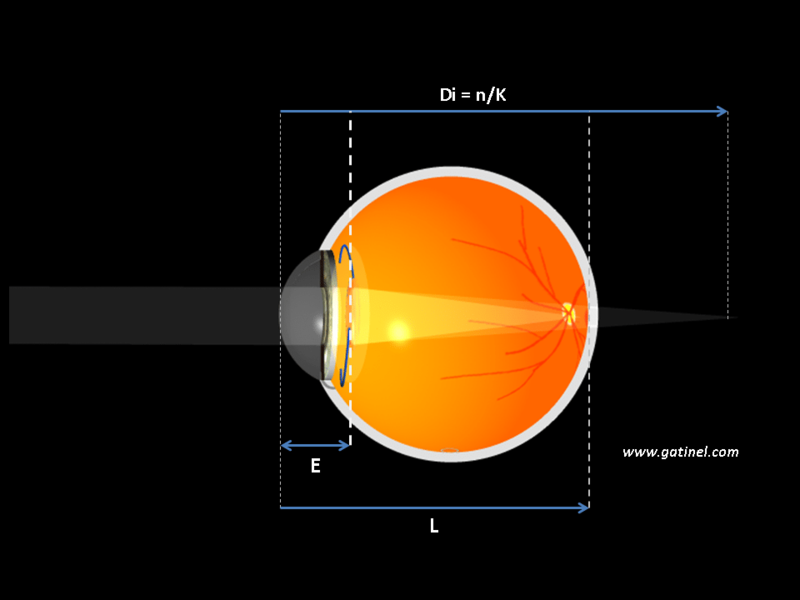 The distance of the implant to the cornea is rated E. On the diagram, observed that the distance between the first image (formed by the cornea) and the implant is equal to Di - E.
To see the eye net in distance vision, the implant must focus from rays of the first image in the plan of the retina. Called the axial length of the eye, the distance between the implant and the retina is equal to L - E.
We know the position of the home to which converge the light after refraction by the only cornea (eye aphake). You can apply the formula of vergence from this focal point, which serves as an object for the implant. The vergence of the retinal image corresponds to the distance (R-W). 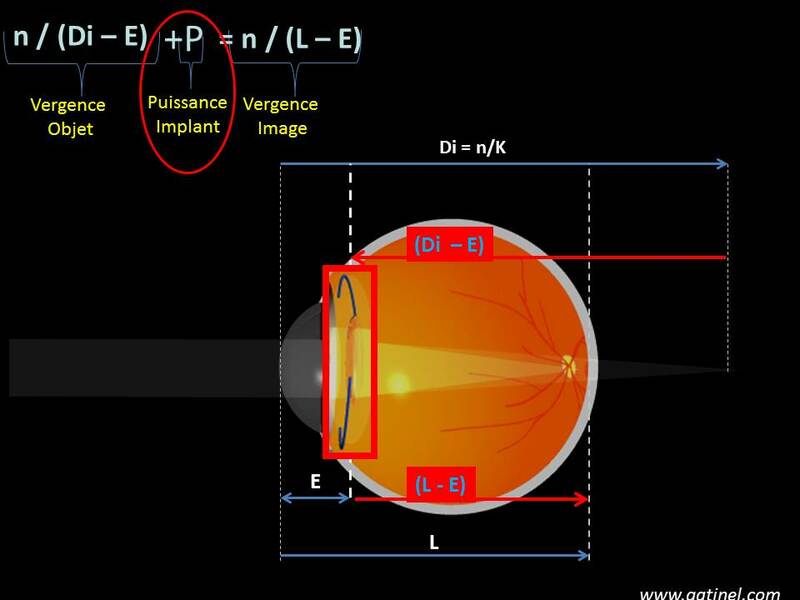 Vergence formula can be applied to the implant, whose subject is the image formed by the cornea, and the image must be formed in the retinal plan. n / (Di - E) + P = n / (R - W) where P is the power of the implant to the eye giving the emmetropia. The theoretical formula expresses (vergence) power of the implant depending on the axial length of the eye, the keratometry and the actual position of the implant in the eye. If the keratometry is measured at 43 D, axial length at 23.3 mm, and the actual position of the implant is estimated at 5 mm, we obtain P = 21.5 D (with n = 1.33). It is important to observe that in this formula, E is the only variable that cannot be measured in preoperativeSince this quantity corresponds to the final position of the implant in the eye, and it is not equal, neither anatomically (the implant is much thinner) or optically the lens. We can not simply replace E by the preoperative depth of the anterior chamber measured in pre operative because the withdrawal of the volume occupied by the cortex and the nucleus of the lens, the behavior of the implant in the posterior segment are all variables able to vary the final position of the implant. Thus, this formula is the "mother" of all modern formulas of implant. It allows to calculate the power to give the implant to correct the operated eye cataract for distance vision. It neglects a number of factors and uses some simplifications (the cornea and the implant are considered thin lenses). Them theoretical formulas of different generation differ mainly in the way they seek to anticipate better the value of the actual position of the implant. This position will be predicted even more away from the cornea the eye is long, and the cornea is arched, with the formulas that use these variables in the predictive calculation. For the calculations of "optical" distances separating the elements (cornea / implant) from the anatomical positions, must replace their equivalent simplified from the cardinal points. What are these plans (see key plans and paraxial optics) which serve as reference for the calculation paraxial optics. 9 responses to "implant calculation – theoretical formula"
How can you choose the best way to make your life easier? Actually need to make a choice, knowing that a slight difference in correction between the eyes (if both are to operate) can reduce the dependence on the glasses; for example, operate an eye to see net by far, and leave one slight myopia on the other to ease the near vision. It's everything you to know under what circumstances you will accept as having to wear glasses and make a choice accordingly. When calculating the overall vergence, do you consider that the Rays having crossed the cornea are all parallel before coming through the implant (radius coming from infinity converging at the implant hearth)? The calculation of the overall vergence appealed a vergence formula that does not consider the real path of the rays: this formula of vergence comes from some simplifications made in paraxial optics. The calculation of the path of rays (ray tracing) is a different approach, for which the convergent impact of the rays on the implant is of course considered. is the measurement of the distance L (actual geometry of the eye in depth) accurate? Is the principle of the instrument used to measure it free from the actual vergence of the Crystalline lens To replace, and that has varied recently in my case By a side effect of cataract? Indeed, I understood that the recent surplus of my myopia (2 diopters!) was related to cataracts and not to the shape of my eye, which remained stable over 40 years if I believe the history of my eye prescriptions before the onset of my cataract 2 years ago. In other words, if the distance L measurement is affected by the current vergence of my Crystalline lens With her cataract, I'm afraid of having a myopia over-corrected by the operation. Perhaps it would be better to calculate L from the actual elements of my myopia before the onset of cataracts? Thank you for your clarification on the principle of the measurement of L and its dependence on the vergence of the Crystalline lens To replace. The measurement of axial length in interferometry (OCT, optical biometrics) is not significantly altered by cataract and vergence of Crystalline lens (Even in case of index myopia). There is therefore no risk of overcorrection of myopia by a mésestimation of the axial length. Can you tell me why since my cataract surgery I see, very often, a very regular circle of light for example if a source of light is perpendicular to my eye operated or around a source of light isolated in the dark Like a simple bright spot or a morning light type alarm clock in the dark. It's like I'm seeing the edges of the implant! It's quite unpleasant although my infinity view is perfectly corrected. I read with interest the article about dysphotopsies, I thank you. Operated cataract in April 2018, I still feel, even I feel more, the discomfort of this circular light stray under certain conditions. My question would be: what can I do and can the retina be affected (or the eye in General) by this phenomenon? Thank you for the reply that you have kindly given me already and excuse me if my new message has already reached you. (I start again because I think I sent it badly).